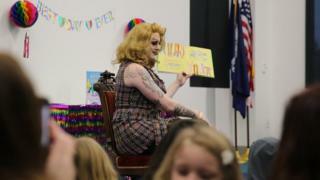 Drag queen story hours - events where drag performers read to children - are moving out of the big cities and coming to conservative southern US states. A group of drag queens stand in a small room at the back of a public library in South Carolina, their bright outfits in contrast with the beige walls. Children file in and quickly scan the larger-than-life characters before turning their attention to running around and playing. "There are five drag queens walking around this room and not one kid has walked up to us and said 'you're so weird'," says drag queen Rylee Hunty. "Kids exist in their own fantasy world and we fit into that." The children assemble on the floor in front of Rylee as she starts to read. After a page or so, she is interrupted by a young girl who stands up and offers Rylee her bracelet because she's "a princess". Outside the library, armed police watch over groups of protesters and counter-protesters chanting at each other in the rain. Each side representing a different view of the future of the American South. Drag Queen Story Hour was established in San Francisco in 2015, and has since spread across the US and around the world. While the Greenville story hour is not officially linked to the organisation, it is part of a growing movement to bring these events to Middle America. Jonathan Hamilt, a co-founder of Drag Queen Story Hour in New York, told the BBC they have seen "an exponential growth in the number of events in more conservative, rural and southern states over the last year". "We have chapters in Nebraska, Indiana and Alabama. I think it is partly a reaction to the political landscape of the US right now and a need for more queer programming for children." Mr Hamilt says events in rural areas "definitely see more protests". "When you leave big liberal areas, people tend to be more conservative. Their fear can come out as anger." Rylee says she is keen to show the children at the event that diversity exists in Greenville. "I knew from a young age I was different. If I had this when I was younger, maybe I would have had a happier high school experience rather than being confused and sad and having anxiety," Rylee reflects. "I felt like a bad person. 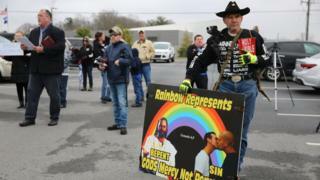 You're in the South - [people think] if you're gay or different you're going to hell." This sentiment is shared by Princess Mocha, another drag queen reading at the event. She strides up and down in front of the children in a fuchsia jumpsuit and towering high heels, canvassing opinion on whether giraffes or elephants are the group's preferred animal. The children's eyes follow her back and forth as she reads. "You'll move mountains, kid", Princess Mocha reads from her chosen book, before pausing and turning to the crowd. "You really will," she adds. On the day of the event, the roads around the library are closed, and security is tight after threats of violence were made against those attending the story hour. Amanda Osborne, one of the event organisers, told the BBC that "veiled or direct threats to attendees and the drag queens has been the scariest part". 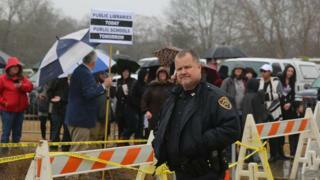 "There has been an armed guard posted in our local library every day for the last week. That's where we are in our community right now." 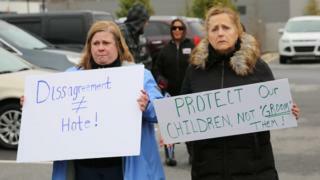 The opposition to the story hour was spearheaded by the Facebook groups "GOP Politics of South Carolina" and "Greenville Tea Party" who organised a "pro-family community gathering" to coincide with the event. "I just disagree with targeting children," says protester Jan standing outside the library. "They are actively promoting sin and wrongdoing and they are doing this to children. "What they do in their own home or at some nightclub amongst consenting adults - have at it. But don't involve children." The library, being a public institution, is bound by the First Amendment of the US Constitution which enshrines the right to free speech in law. In a statement, library officials told local media that "meeting spaces are available on an equitable basis, regardless of the beliefs or affiliations of the individuals or groups requesting their use". Jan says that she thinks "that's a cop-out". "There should be a set of community standards for decency," Jan says. "If a group doesn't follow that, then they cannot hold their meetings in the library." Jan links the event to a wider trend she perceives in the US. "I don't see why their rights should trump ours. It always seems in society today that's what happens. They want to be considered the victim, they want to have special rights." In response to the controversy surrounding the event, many counter-protesters assembled at the library. Natalie Shaik, one of the event organisers, told the BBC it was a "big deal" that so many people in Greenville came to support them. Despite, or perhaps because of the controversy, the event is well attended and additional readings are laid on for the queue of children waiting. The tradition of story hours in America began in the late 1800s in Hartford, Connecticut. Caroline Hewins created a read-aloud programme and by the end of the 19th Century the events were commonplace across the country. Public librarians have done a good job of convincing the public that they are neutral, but through history they have had an inconsistent response to First Amendment issues. In the early 20th Century, socialists and communists were often allowed to meet in libraries, for example. By the time the Cold War started, that was no longer the case. During the Civil Rights movement there were open protests by black families against "Little Black Sambo" being read at story hours. The book was accused of being racist and many libraries took it off their shelves. The passage of time has a tendency to change local moral horizons. Amanda Garrett has lived in the South her entire life. "It bothers me so much when people try to claim that they know what southern morals are, or that they own the values of our community. "That gets me at a very personal level." 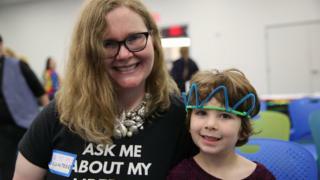 Ms Garrett's son Alex spent the afternoon listening to the drag queens reading and making a crown with pipe cleaners. "The drag queens are dressing up, having a great time and confident about who they are," Ms Garret says. "That's something Alex can be too if he wants." Christia Spears Brown is a professor of psychology at the University of Kentucky who studies gender development in children. She told the BBC that while these events can seem "silly and frivolous" they could lead to "positive outcomes for young children if they feel able to express themselves". "Conversely we know that there are negative outcomes for children who feel pressure to conform," Prof Brown said. "Those children are not as psychologically stable." 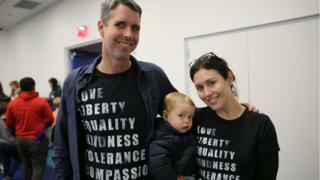 Image caption Elizabeth and David Truby took their 20-month-old son William to the event to "show up for people who are marginalised"
Prof Brown told the BBC: "Culture can support, or not, a child's gender identity but it can't create it. 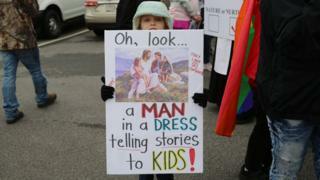 "To be clear, you can't make kids gay or transgender. Think of it this way - the vast majority of LGBTQ people saw predominantly cisgender and straight role models growing up. "The frequency with which traditional gender stereotypes are reinforced - every time a child uses a gendered bathroom or is called a good boy or girl - far outnumber the instances that gender is questioned, for example being read to by a drag queen."